The following is a guest post about contractor pensions. If interested in submitting a guest post please read my guest post policy and then contact me. If you’re a contractor, chances are you love what you do! However, no matter how much you love what you do, at some point, you’re going to want to retire. As a contractor, you work for yourself, so retirement is a bit different than it would be if you had W2 employment elsewhere. That’s why it’s so important for you to plan for your life after contracting. Today, we’re going to discuss what contractor pensions are, the tax benefits that come along with them and how they can help you plan for life after contracting. A pension is an investment vehicle designed to give those who use them a better life after retirement. They are pretty versatile in the fact that they can be small or large and it’s possible to have more than one. When you have a pension, you invest into it on a predetermined basis. It could be monthly, quarterly, annually, or at other intervals of your choice. When you turn 55, you have the option to let the money sit and earn you more interest or to start taking your retirement payments without penalty. Tax Break Now And Later – When you earn money, if you make the decision to invest that money into specific types of investments, you’ll be able to avoid paying taxes on the money that you invest. Pensions are one of those types of investments. So, investing for retirement can bring down your tax bill! When it comes time to pull payments from your pension or pensions, you won’t pay taxes on the money you receive. So, by putting your money into a pension, you’re planning for retirement while saving tons of money on taxes! Give Your Nest Egg A Way To Grow – If you put your money for retirement into a savings account, you’re actually losing buying power. Yes, you may earn a small percent of interest, but that most likely doesn’t come close to the rate of inflation in the United States. Therefore, when thinking about retirement, it’s important to think about using a form of investment that will allow your money to grow faster than the rate of inflation. Pensions are an investment vehicle that can help you accomplish that goal. The average rate of return on a pension is almost 8%, which is far higher than the rate of inflation in the United States! Steady Income When You Retire – If you plan your cards right, you’ll either have several small pensions or you’ll have a couple of large pensions by the time you’re ready to retire. With pensions paying out, you’ll never have to worry about work again, you’ll have the steady income that a retiree needs to live a fulfilling life after contracting! If you’re a contractor, it’s incredibly important for you to think about what you’re going to do after contracting; how you’re going to handle your financial obligations in your retirement years. 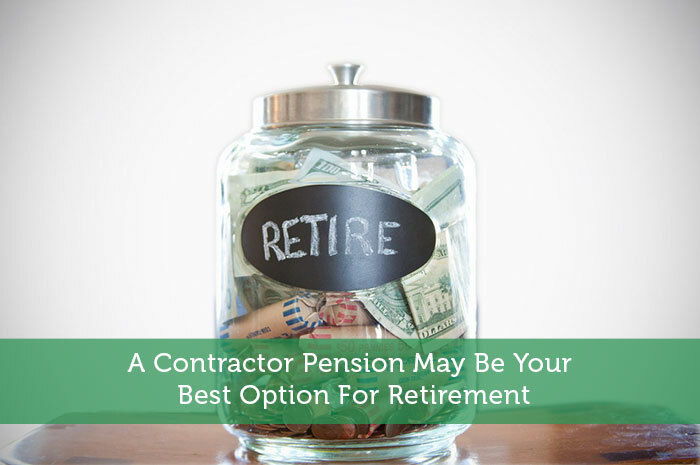 One of the best ways to do that is to take advantage of a contractor pension! Even if a pension isn’t your entire retirement plan, it’s best to at least use the tool as a way to diversify your portfolio! Yes, I agree that it is a smart way to invest our retirement fund rather than to sleep in the bank through savings. In this, we are not letting the banker get rich with our money. Instead, we get wealthy and secure if we can let our pension fund to make more money and grow. Thanks for sharing this! I hadn’t previously heard of a contractor pension and will definitely keep in mind if I decide to go this route with my career. Are these available in the US, or just the UK? I have a few friends who are contractors that are only using Roth IRAs for their retirement funds. They are also counting on Social Security. My friends could also set up an individual 401(k), but have so far limited themselves to Roth IRAs and their relatively low contribution limits. Which raises the question, are there contribution limits on contractor pensions, and if so, what is the limit?